The scarf I finished on Friday night/Saturday morning while listening to the news from Paris on the radio. Destined for a Christmas present. 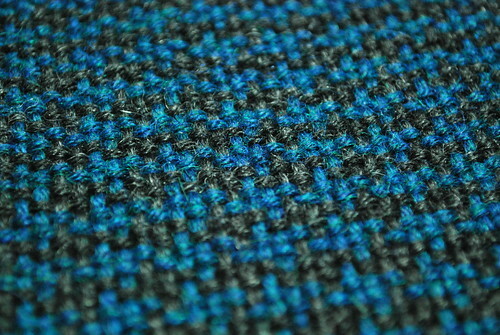 2 x 2 houndstooth check on 7.5 dpi heddle; the yarn is Herriot Heathers from The Sheep Shop - 100% baby alpaca and feels like it! To Festiwool at Hitchin. Given that I'd been up until after 3am listening to French radio, wandering around the house and ranting, I wasn't exactly the most awake I've ever been. But it was a lovely event, and good to meet some knitters and look at some beautiful things. Now off to dinner with friends in the village. I had an idea for a post tonight; but there are no words compared to what's going on in Paris. Other than maybe, dear God, not again. If you've watched/listened to the news today, it won't have escaped your notice that the Indian prime minister is in town. And if you tried to get through the Westminster area, you'd have been sent off in all sorts of odd directions; all roads closed all day. This surprised my colleague and me; we needed to get to the building in the middle to retrieve our visitor, the guy delivering a training course to our colleagues, and take him to lunch. There wasn't nearly as much fuss when the Chinese premier came last month. 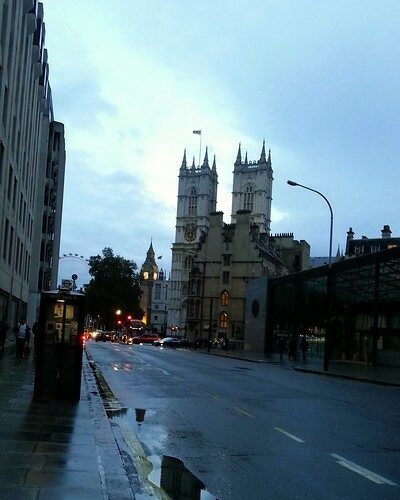 But it was so wonderful how quiet the whole area was without traffic. 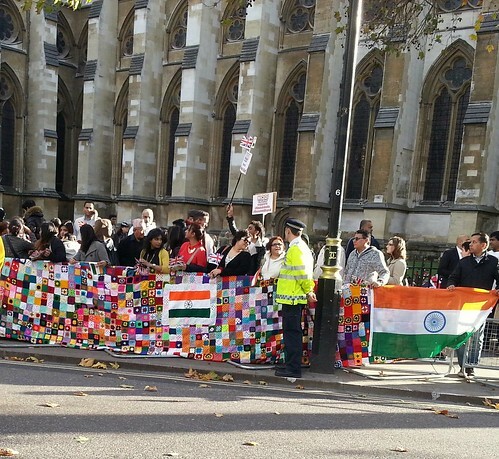 I gather there were protesters up on Whitehall, but we couldn't get up that far; on the way back, we did see the small welcoming committee, with their lovely crocheted banner, chatting away to the police on a warm, sunny afternoon. 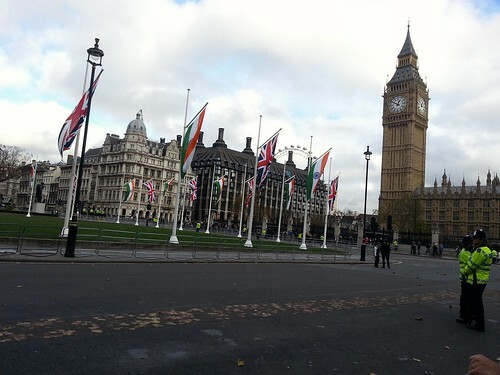 There has been so much overshadowing kerfuffle about the Cenotaph observations this year. I used to work about 100 yards from the Cenotaph and have generally posted something here about Remembrance Day, but this year even showing a picture of the Cenotaph might contravene my draconian non-partisan employment clause! On the way from my new building to my old building, I pass this: the monument to the Bali bombings. 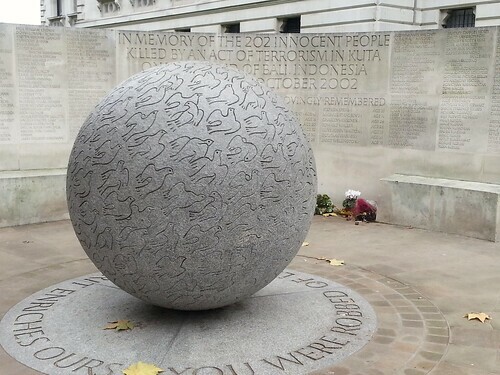 There are 202 doves; people of 21 nationalities were killed; and it stands as a powerful memorial. Very obviously, we need to remember people who voluntarily, or under duress in time of war, put themselves in harm's way to serve their country. We should remember their bravery, and terror, and the sacrifice they made willingly or unwillingly. And we should also remember the "collateral damage"; most obviously military families and the civilians who can't get out of the way. I remember realising, with a shock, that three guys having a kickabout on my village green a couple of years ago were each playing with one prosthetic leg. I remember a friend visiting the village at about the same time having a similar experience in the queue in the shop one evening when she bent down to pick up her bag and realised half the legs under the shorts of the fit young men in front of her were made of high-tech metal. There are also the MSF medical staff killed while volunteering their services to save lives in appalling circumstances; and the people drinking in Birmingham pubs or dancing in the nightclubs of Bali, totally unaware they were part of someone else's war. There are no more World War I veterans, and the number of living World War II veterans is dwindling rapidly; but we need a space to acknowledge the chaos wars continue to wreak in so many lives. I'm loving the Great Pottery Throw-Down on BBC2 at the moment. Particularly the appreciation that this stuff takes time. I've always made things, and combined colours. But the first time I actually did this formally was at a pottery class. I made something or other in the basement of the Student Union (I think?) at Cambridge, and then some pots during my MSc at Loughborough; I still have one or two bits and bobs from the Loughborough club, and I think a couple of bowls may still be around with my ex-husband. And then in the late 90s I went to a class at Cottenham with Debbie Cain, who had a completely different attitude to pots; you hand-built (there were wheels, too, but not enough for everyone; and there were lots of things you could do by hand-building); and there was a certain satisfaction in hand-building pots. Everything took a long time compared to Great Pottery Throw-Down - you only had 2 hours a week, you had the time unwrapping and wetting-down your pot, you had to take the tools out of the box again and wonder which scraper you used last time, you probably only had about an hour a week to do stuff, you queued for the kiln - but after a couple of months, you got something. 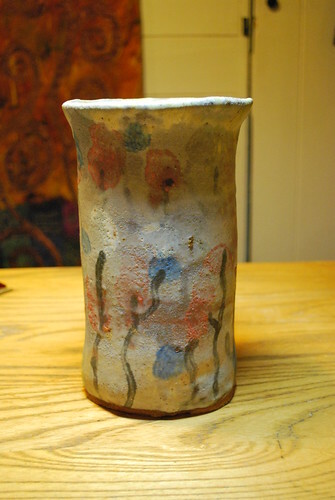 I have this 24cm high x 10-14cm diameter vase. I use it for stocks in spring, and sunflowers and chrysanths in autumn. To all extents and purposes, it's rubbish. I built it over three sessions, and you can see that. It's massively lumpy. There are bubbles and really-not-correct textures in the glaze, and I didn't understand what the pale glazes were for, or what they did. The top flares out and for some reason I've textured the internal surface of the flare. And I love it; and I'm proud of it. By all standards of pottery, it's rubbish. When I take it down off the top of the kitchen cupboard to put flower in it, I smile. 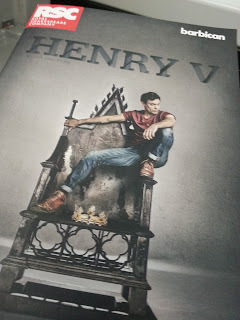 Just spent the evening at an excellent performance of Henry V at the Barbican. Had the pleasure of the company of Nic AKA Yarns from the Plain. 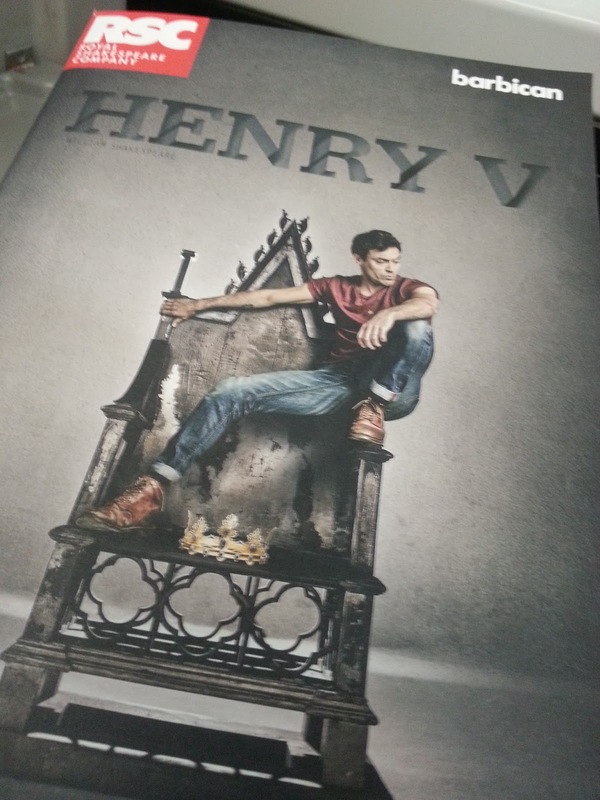 Has to be said, I wasn't totally convinced by Alex Hassell's Henry during the first half - he was edgier, less authoritative than I'd seen the part played before - but he showed Henry as a man who'd grown out of his wild days but was still very much a work in progress, and it worked extremely well. The other absolutely stand-out performance was from Oliver Ford Davies as the Chorus, appearing in his cardi and cords to apologise for the inadequacy of the play. If you can get tickets, go. and as it's London-themed, I've been taking the odd photo here and there to get people into the mood. Last month, I was waiting for a bus to take me to book group, and realised that my new bus stop (we moved offices in August) isn't at all in a bad location. A spool of blue thread, by Anne Tyler. London: Vintage, 2015. Abby Whitshank always starts the story of how she and her husband Red fell in love with It was a beautiful breezy yellow-and-green afternoon... This is the story of four generations of Whitshanks and a house; and, increasingly, family secrets. I've been very bad at keeping up with my book reviews, and it's over a month since I read this book, so some of the details of plot have escaped me; but I'd unhesitatingly recommend it! The monogram murders: the new Hercule Poirot mystery, by Sophie Hannah. London: Harper, 2015. The cycling anthology. Volume 1. Edited by Ellis Bacon and Lionel Birnie. London: Yellow Jersey Press, 2014 [originally Peleton Publishing, 2012]. A fine collection of essays of various lengths on professional cycling, written by some of the best journalists in the business; Particular favourites are David Millar reflecting on his impending retirement and his rides with friend Michael Barry around Girona; the story of the Orica-GreenEDGE team; Kenny Pryde with an unusual take on drugs in cycling; and two views of Bradley Wiggins from William Fotheringham and Jeremy Whittle. I'm very glad there are another five of these volumes to get through! Personal, by Lee Child [audiobook]. Read by Jeff Harding. Whitley Bay: Soundings, 2014. Someone has taken a pot-shot at the French president, and that someone is obviously an expert sniper. Reacher, not a bad sniper himself, is called in to shortlist the candidates; and then to hunt down a man he'd already put in jail once. This one takes Reacher to Paris and to London; Child is at his best when introducing Reacher and his companion to British life, as an ex-pat Brit, and this canters along at a fine pace. It's amazing that this series hasn't really flagged in 19 books. Face of the devil, by N J Cooper [audiobook]. Read by Julia Franklin. Whitley Bay: Soundings, 2011. Teenager Suzie is found dead near her uncle's boat on the Isle of Wight; Olly Matkin, a schizophrenic schoolmate, is found covered in Suzie's blood, claiming he's killed her to take the devil out of her. Psychologist Karen Taylor and DCI Charlie Trench investigate. Did Olly really kill Suzie, and if so, was he put up to it by someone else? This is excellent, and the Isle of Wight setting is really interesting too. Julia Franklin is a good reader, if not wildly exciting. .... no, it's OK. I'm not going to say it. and although I only have one child to knit for this year, I still have something of a heap of things to make. Not least because I have gently introduced my brother to the Way of the Hand-knit Sock, via making them for his wife who has toasty feet while he complains about his cold toes. Bwahahaha. Let's see where we are next week. Now, although it's only 8:45pm and I've only been in for an hour, I'm off to bed with knitting, books and my phone/Bluetooth speaker as I've just been told there's a Charles Paris I've missed on Radio 4. Bill Nighy, mmm. ... and the realisation that religious terrorism is still very much alive today. These photos are from Lyon, taken on 17 September this year. 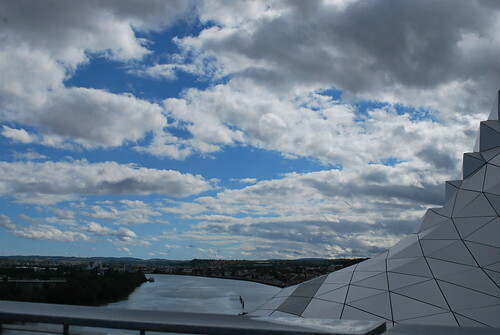 Since I was last in Lyon in May 2013, they've completed a mad and beautiful thing right at the tip of the peninsula which divides the Saône from the Rhone just before they flow together and sweep down towards the Mediterranean. It's part social housing, part world-class museum, part industrial park; it's a grand projet in the modern French tradition, and in a way we somehow fail to manage. Here's the view to the South through the confluence, taken from the top of the amazing new museum I hope to blog about later in the month. I am short, so you'll have to believe me that the line of posts marks the final coalescence of two of France's great rivers. And here's the view to the North; more modern development to the right, 19th century development to left; the mediaeval centre is out of sight on the other side of the presqu'île. When you go to Lyon and you're out of the tourist areas (stopping off for a glass of something after the triumphant conquest of a yarn shop, say...), people ask you what brings you to their city. And when you say "I'm here on holiday" they do a double-take. 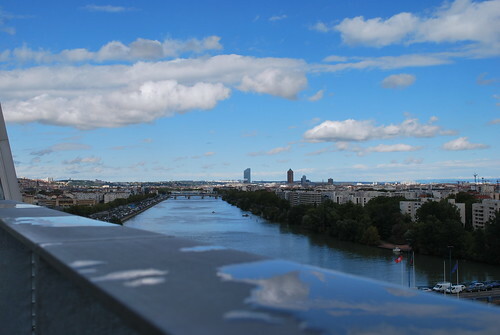 Lyon spends a fortune advertising itself as a destination; it's France's second city; it has wonderful history... But then, you could say the same thing in the UK context about Birmingham, and maybe people would react the same way. *Renaud is actually singing about teaching his daughter about penny chews and sherbert lemons here, but it felt like the right accompaniment. One of the many reasons I don't blog much any more is because I spend nearly 4 hours of each weekday commuting. And while I love trains in general, sometimes they exasperate me beyond bearing. But the two London stations I see most often are really beautiful these days. 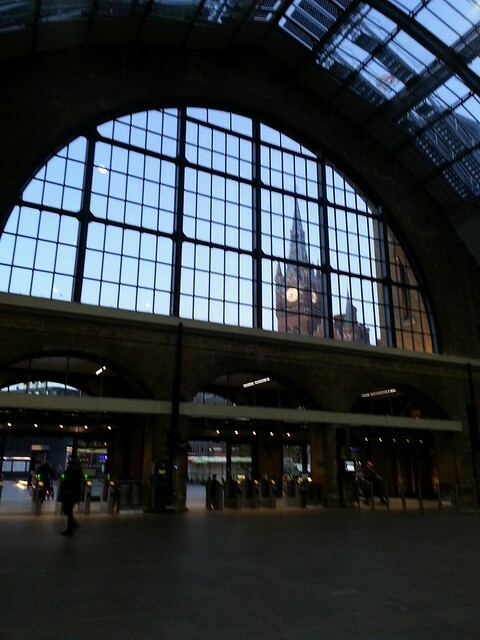 Here's the clock tower of St Pancras, seen through the uncovered and refurbished windows of King's Cross. A decade ago, those windows were covered in netting, absolutely filthy and mostly broken. A decade before that, St Pancras was a dilapidated shell, saved by John Betjeman and other campaigners in the 60s but a shadow of its former glory. Now both are thriving, living stations, the centre of a new complex which includes Central St Martin's School of Art. When I hear people getting on the "all modern life is rubbish" tack, I think of the restoration and development of this area and smile. 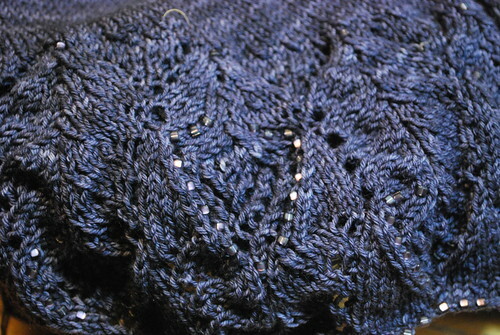 It's not very often that I knit something for myself - something that isn't a sweater, anyway. 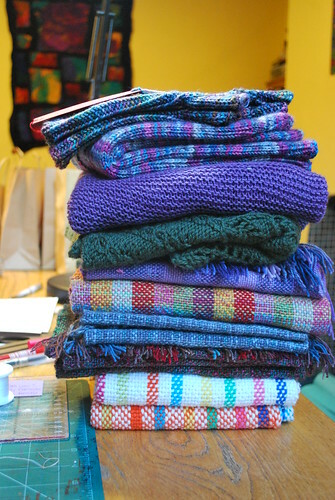 Usually, I'm knitting things to give away or as samples for classes these days. 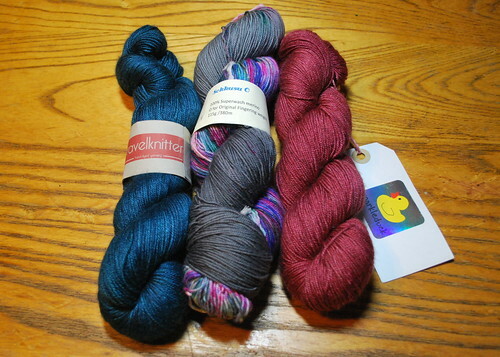 This Vacillate pattern, though, was something I saw and instantly wanted; and while I was trying to choose yarn, the Lava quarter from The Golden Skein arrived. 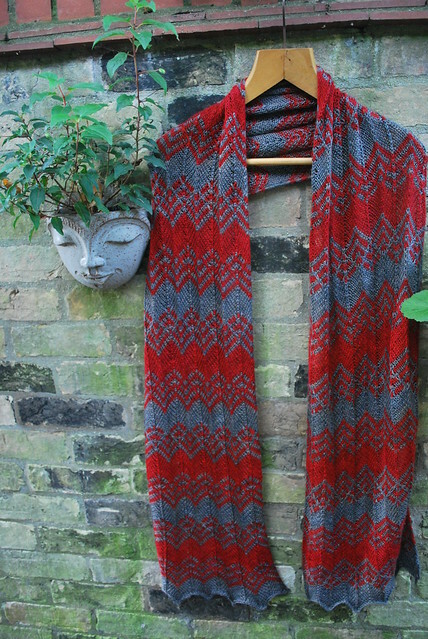 The red yarn in this skein is dyed by Travelknitter, the grey by Sparkleduck. Both are dyers I love, and both had a high silk content (Travelknitter's Tanami silk and baby camel, Sparkleduck's Pulsar silk and BFL). This was done as a knitalong (KAL) in the designer's group on Ravelry, and the deadline for posting photos was October 31. As ever, I only just made it! I think this one's going to get a lot of wear this winter. The pattern is great - a simple chevron for most of the rows, with a bit of slip-stitching along the way - and it feels very Art Deco. So, I'm trying this thing again. This time round, I'm going to try to make things easier on myself by saying I'll just post a photo with a bit of a caption, and then if I get anything else written, that'll be great. 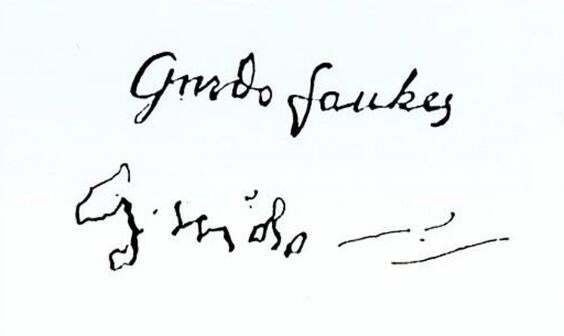 But I'm aware that this blog has been all-but-moribund for a couple of years, other than book reviews (and thanks to everyone who has commented on those! ), so anything's better than nothing, maybe? My favourite photo of this year so far is one I took with my phone on the way to the university library one Saturday morning in July. I cut through my old college (Clare), and there was due to be a wedding in the gardens that day, so the beautiful new(ish) gate to the garden was closed. 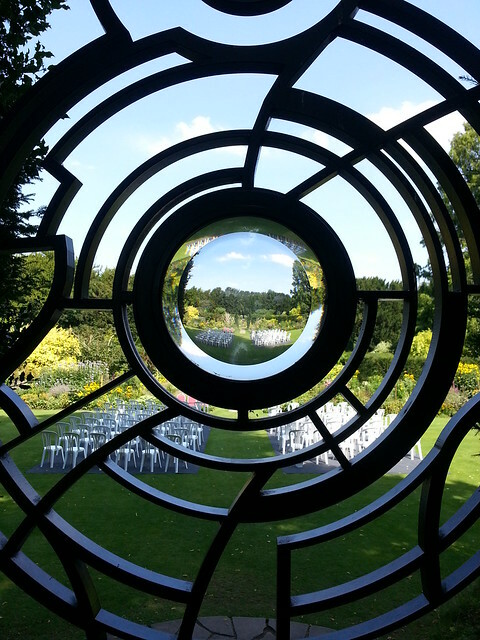 I loved the threefold reflection of the chairs through the lens in the gate, and the colours seemed so quintessentially English. All the very best to the couple who were married on that day.